Factory fog/driving lamps cost about $360. Our lamps cost less, outperform and include installation directions! Want to brighten up the horizon? 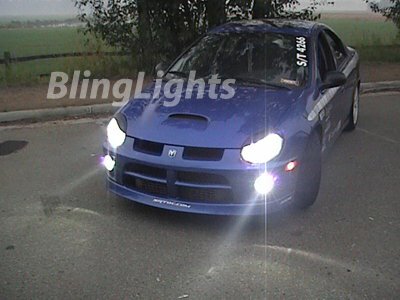 The BlingLights line of high performance lights will do the trick. The BL-300w offers the performance and brightness of Xenon H.I.D. bulbs and have photometrically designed hardened glass lenses that pierce through the darkness in any weather condition. 90 degree beam pattern is both wide and far reaching, die-cast metal housing 55W H3 xenon 4300K white bulbs combined with 10,000K LED parking lights, 3.5" D x 2 lamps, heavy-duty mounting brackets, 3-function switch, deluxe wiring harness included. BlingLights is one of the true leaders in the lighting industry. They produce Top notch lighting equipment. BlingLights lamps stand out as "lights with attitude". How do I pay by credit card? Once the auction is over click on one of the credit card pictures on the bottom of this page. Just enter your credit card number and auction information. That is it! In the case that paypal is having trouble or your address is unconfirmed you can still pay by credit card instantly to our online account at www.bidpay.com. The lights are great and I use them almost every night. We get a lot of fog in the winter here on the west coast of Florida, and these lights project a perfect beam to cut through. They look great and fit perfectly too. Your product exceeds Nissans factory lights by far & at 1/6 the cost. These lights are VERY high quality with a sealed, heavy glass lens and a strong housings. Everything else I saw on the market was all plastic. I am going to order another set as a backup for the future. Here are some photos, take your pick! Thanks again.